This magnificent luxury 9 bedroom estate vacation home is located in Formosa Gardens - Orlando, Florida. Formosa Gardens is a gated community just 3 miles from the magic of Disney! Offering a relaxing lake view, 4 King Masters, 3 Queen Masters, two themed kids' bedrooms, a fully equipped eat-in kitchen, a 42" plasma TV in the main master, TVs in all other bedrooms and a living area featuring a 52" TV, DVD player and Netflix. 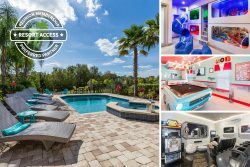 Outside, you'll find an expansive pool with spillover spa, kiddie pool, a summer kitchen with gas barbecue grill, pool bath, pool alarm and a beautiful lake view! There's also a home theater with a 100" projection screen, Blu-ray player, theater-style seating – plus a game room that features an arcade machine, 42" LCD TV, Nintendo Wii, PlayStation 3, DVD player and Netflix! If the number of persons in this home exceeds 18 at any point in time, including daytime visitors, a mandatory security deposit of $750 will be required. Failure to pay the security deposit will lead to a cancelation of the reservation. The complimentary BBQ grill is provided free of charge. Reunion Vacation Homes and/or the Owner do not accept liability for equipment failure. **It is the guest’s responsibility to clean and maintain the barbecue and replenish the propane as required. Our 2nd time at the same house. Great home and customer service, also easy to book. We loved our time at Ruby Villa. The house was great and the pool and outside space was even better.